My lesson with Elizabeth was fantastic! I'm preparing for a wing shoot out of state and Elizabeth moved some traps around to give me some realistic targets for that type of shooting. She gradually increased the difficulty as the lesson progressed. I left the lesson feeling much more confident. She has an uncanny ability to identify my errors and correct them in a way that I understand and can remember. She is the best and I can't recommend her enough! "I first approached Will in an effort to become a better bird hunter in 2009. At the time, I was at best an average shot and had no desire to accomplish anything more than to improve my chances of getting my bag limit on my next hunting trip. Within a few lessons, Will was able to make me the talk of my hunting buddies. One of the things I admire most about Will is his willingness to match your level of commitment to improving your shooting game. Whether it is a short term goal like getting ready for a hunting trip or a long-term goal like winning a state championship, Will can give you the tools for success. I don’t know many other sports or hobbies where you can get one on one instruction from one of the best in the world. Taking a shooting lesson from Will is like getting a Wimbledon level tennis pro to show you how to serve a tennis ball or a PGA golfer to show you how to use a sand wedge. His training facility is top notch and he can create any type of target presentation that you can imagine. As I write this, I was actually out there shooting with Will just yesterday and told him in advance of my shooting lesson about a target that I had missed repeatedly in a tournament the weekend before. It’s a type of target that you don’t see very often but has always given me trouble. When I arrived for my lesson, Will already had that type of shot presentation set up on one of his traps for me to practice with and within 20 minutes he had me breaking that presentation on a very consistent basis. In general, I owe him a big thanks for all the enjoyment, success and self-gratification I’ve gotten from improving my shooting abilities over the last couple of years." "Elizabeth, Thank you for the shooting lesson today. I really learned more in the hour than I had anticipated or thought could be accomplished in the time frame. I really enjoyed your style of teaching and look forward to my next session." "Will Fennell’s new training facility offers every target presentation imaginable- lots of traps and a tower (with two more in the works) positioned around a four acre field with some serious terrain. After two days’ shooting I don’t think I saw the same presentation twice! Will coaches shooters from beginners to tournament level, guys and gals, young and old and has the experience to get you where you want to be. As a world class competitor himself he has been in your shoes. looking over your shoulder it’s all about you and giving you the know-how and confidence to achieve your goals. you feel good about yourself. He’ll bring out the best in you with encouragement such as, “NICE SHOT!” and “Come on Bubba, I want to see you break five in a row” and “Want to try to break that 100 yard battue?” and “OK now I want to see you break it BEFORE the tree”. If shooting shotguns isn’t enough Will has pistol and rifle ranges with steel targets at various distances- it’s great to hear the targets go “Ding!” when you hit them! at the World FITASC competition in Cyprus, and he didn’t have much to work with!" "The lesson with Elizabeth was outstanding. Started with an evaluation and observing how we shot. Then the coaching/instruction began with very good suggestions and directions. She did an excellent job of taking what was there and making adjustments rather than saying "do it this way." You explained all changes as to why they should be done and the desired effects. Had a great time and want to do this again." 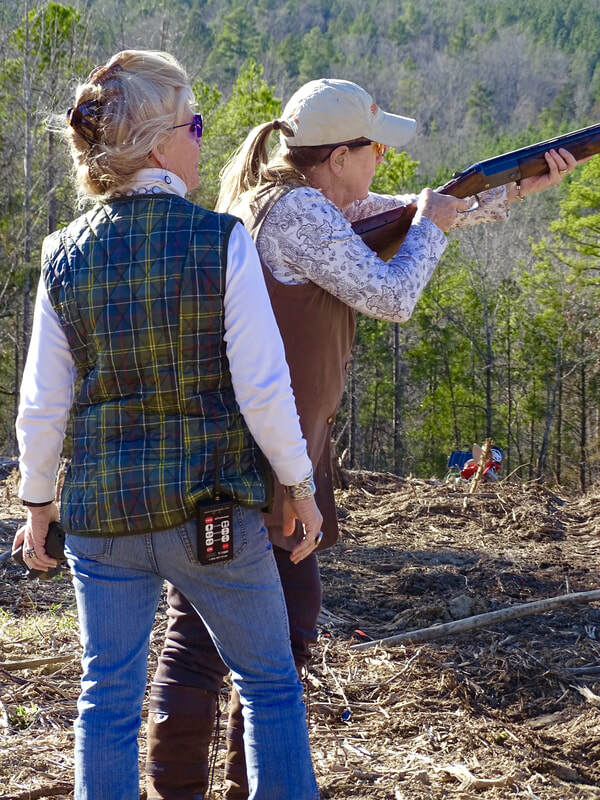 "For the past 8 months I have worked with Will in my quest to achieve consistency in both FITASC and Sporting Clays. I think “consistency” is what we are looking for because we all have days when we shoot great, when our timing and rhythm is perfect. Unfortunately, for me anyway, those days can be few and far between. Will’s instruction systematically built me up utilizing his techniques on all target presentations, specifically for rising teal and crossing targets that were creating lots of “0’s” on my score card. We discussed approaching true pairs, the mental game, pre-shot routines, seeing detail on the target and making corrections after misses. Since he moved back to South Carolina we have continued to work together. He can diagnose problems over the phone and have me hitting difficult targets quickly because I understand his fundamental techniques and his terminology. At the end of the day, being able to communicate and be on the same page with a coach/instructor is the most critical component to success. Will’s style is low key and packed with years of expertise in teaching and helping students. So far, the proof is in the pudding as they say. Since working with Will in 8 months I have had several HOA in small tournaments and 19 Master Class punches. Thanks Will!" I have been doing competitive shooting for the last six years. At first I thought my own technique was all I needed along with lots of practice. I quickly discovered that I needed professional training, to be competitive. I went through several coaches before I started taking lessons from Will Fennell. He helped me develop a shooting technique, that has helped my shooting habits become more consistent and natural. He also helped me get my gun set up(fit) to match my style. He is a calm, consistent, knowledgable teacher. Being able to diagnose your shooting problems quickly and show you how to make effective corrections results in rapid progress. This improves your confidence and shooting satisfaction. You realize his goal is to help you become the best you can be. He is a great teacher at the range or during competition. Will helps you recognize and enhance your abilities. Because of his instruction, I have now improved my competitive standing and enjoy competition more. I was the 2014 NSCA National High Overall Champion in 28 gauge. ​Will has helped me move from AA class to Master class and has taught me that refining my technique and competitive practices is a life long progression. I now have the confidence to enter any sporting clay competition in the world. I will be competing in The FITASC Sporting World Championship in Italy this July. Some are great instructors and others are great coaches. Will is the rare individual who excels as both. In addition to building my target-breaking techniques, he has helped me develop routines to avoid and overcome mental lapses, producing greater consistency in my game. Topping it off, Will is just a fun person be around, so every session is a great time. Whether you're seeking more birds in your bag or more Xs on your card, Will Fennell is the man to help you achieve your personal goals. For those of you traveling to visit us, here is a list of hotels in Rock Hill, just of I-77, all about 45-55 minutes from the Fennell Shooting School, depending on traffic. ​For those coming from the west, there is also lodging off the Gaffney, SC, exit 90 off I-85. This is about 35 minutes from the Fennell Shooting School.